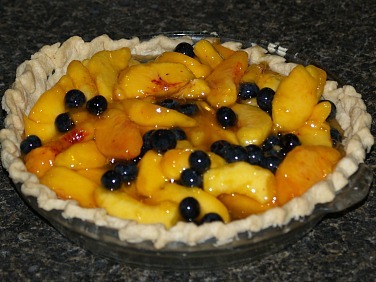 This time of the year I get so hungry for fresh peach recipes. I have been seeing so many for sale along the roadways and they really look good this year. This area around the Appalachians has had so much hot sunshine and a lot of heavy rainfall which attributes to sweet juicy peaches. The problem with buying them is that you have to have the time to use them or preserve them otherwise they will quickly go bad. I have been so busy so it was hard to find time for this. 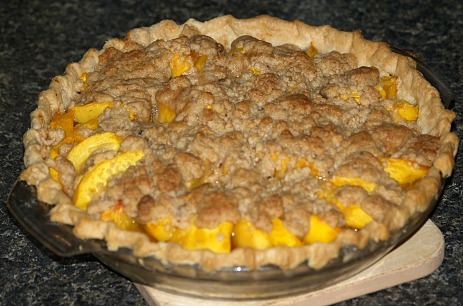 Yesterday the idea of those fresh peach recipes got the best of me! I had to stop and buy some. Just as I expected, they are nice, big and beautiful. Of course, I had to try one and just as I thought they would taste; sweet and juicy. I peeled and prepared for the freezer eight quarts. 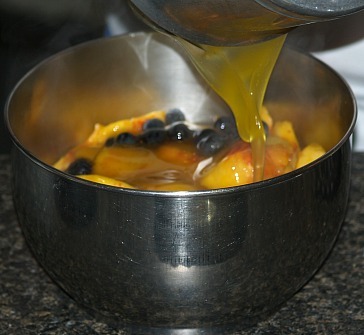 I saved the rest to make the fresh peach recipes which I had been longing for. 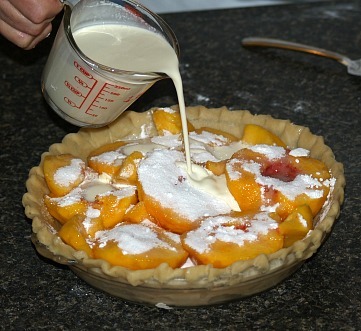 Today I am making several peach pies. If I do not give them away, I will put them in the freezer for later use; that is after I pick one out to try myself. 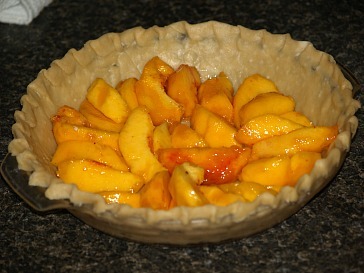 Some of my favorite fresh peach recipes include many of my best peach pies. Many can be topped with ice cream or whipped cream. 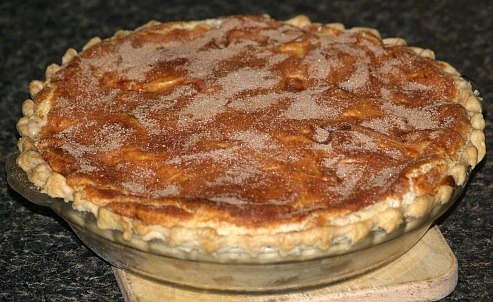 The following recipe uses a baked pie crust but no more baking is required for this delicious dessert pie. Combine sugar, cornstarch and water in saucepan; bring to a boil over medium heat. Cook mixture for 1 minute while stirring constantly. Remove from heat; add lemon gelatin stirring until dissolved. 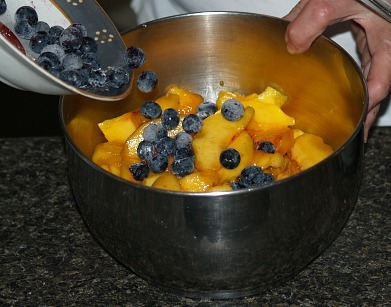 Combine peaches and blueberries in a large bowl; add gelatin and toss gently. 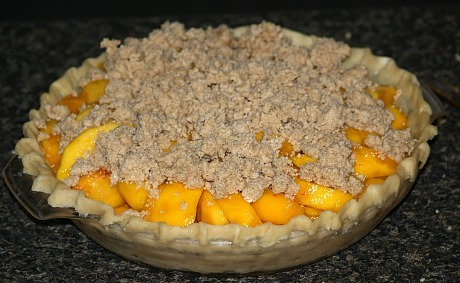 Spoon into baked pie crust; refrigerate for 2 hours. Whip cream to soft peaks; slowly beat in powdered sugar and continue beating until stiff. 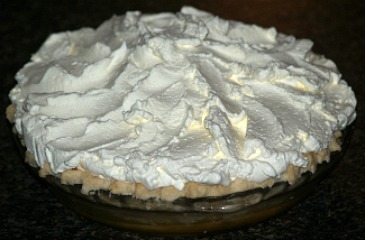 Spread whipped cream over pie; refrigerate for several hours until completely set. 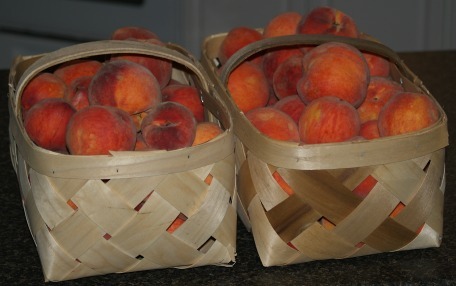 As I said earlier this area of the Appalachians is full of peaches this time of the year. In June cooks here start making homemade peach recipes with ones grown in Georgia. I am sure you have all heard of the famous “Georgia peach”. Well, they are also very famous throughout the Carolinas. Actually, South Carolina out produces Georgia in the production of peaches with a normal year producing over 60,000 tons. My Texas friends tell me the best peaches come from the hill country of Texas. Unfortunately this year, this area saw quite devastation on the peach crop from the weather. A late March freeze, hail storms and other weather conditions hit the crop very hard in this area. The production has yielded a much smaller crop this year making the peaches harder to buy and more expensive than in a good year. 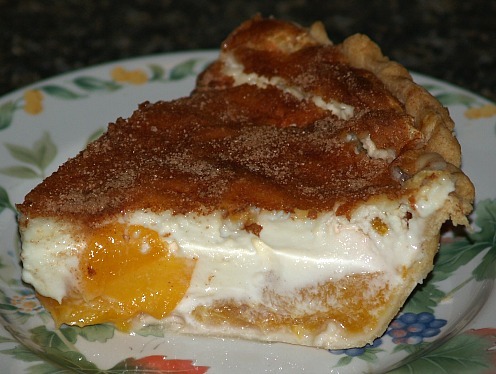 This fresh peach recipe is for a pie with peaches and cream cheese. I love cream cheese in a lot of recipes. This has great flavor with added apricot brandy. 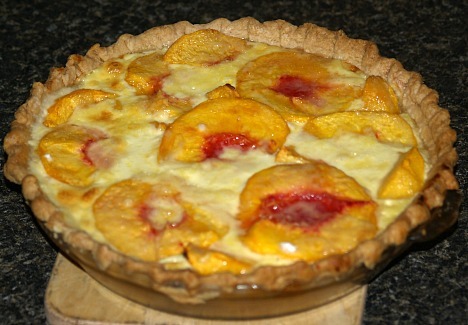 Arrange sliced peaches in pastry lined crust. Combine cream cheese, sugar and brandy in mixing bowl; beat until smooth. Spread cheese mixture over top of peaches. 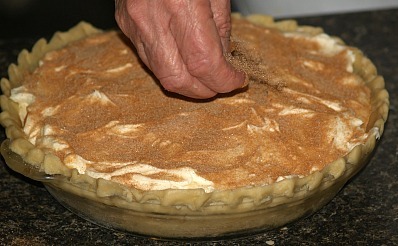 Combine cinnamon with 1 tablespoon sugar; sprinkle over top of pie. Bake in oven for 55 to 60 minutes; cool completely and refrigerate. Although many of these areas claim the fame to great fresh peach recipes, the peach originated in China. Peaches were the favorite fruit of the kings and emperors. In ancient times it was introduced into India and Western Asia. From these countries, growing peaches moved into Italy and other parts of Europe. During the seventeenth century, the peach was brought to the American colonies by Spanish explorers. Here the love for this fruit grew quickly; in the nineteenth century the peach was being grown as a commercial crop in states from Maryland to Georgia. It is now one of our favorites fruits here in the United States as well as most parts of the world. Aside from all those delicious fresh peach recipes, this fruit contains lots of great health benefits making them a good fruit choice. Don’t get me wrong, these benefits do not come with all those additional ingredients like sugar and flour. 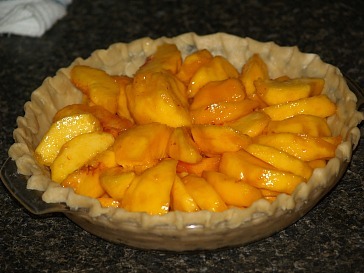 You can still enjoy a wonderful delicious dessert in a simple bowl of fresh sliced peaches. One fresh sliced peach offers you ten different vitamins; A K C E and six B complex vitamins. The high amount of fiber found in peaches contributes to good colon health and reducing cholesterol. Also found in peaches are potassium, phosphorus, magnesium, copper, iron, calcium and additional minerals which help with the bones, blood cells and nervous system. Peaches are very low in calories and contain no fat making them very helpful when on a weight reduction diet. The flesh and skin (I won’t eat the skin) are very high in antioxidants that scavenge free radicals that your body is exposed through food and environment pollutants. 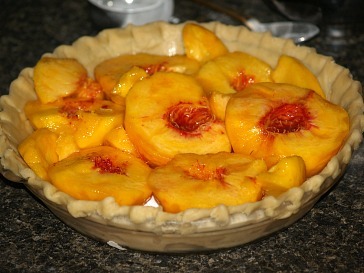 Arrange sliced peaches on bottom of pastry lined plate; sprinkle with lemon juice. Cream butter and brown sugar together; blend in flour until crumbly. 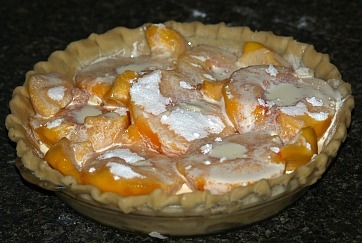 Sprinkle mixture over top of peaches; bake until peaches are tender about 45 minutes. 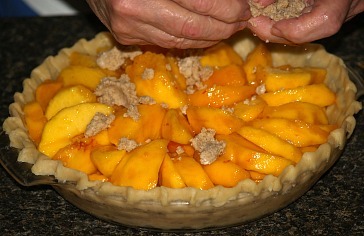 To make great fresh peach recipes you will need to know how to select your fruit and store it. First of all, peaches must be handled very gently. They bruise very easily and then the bruise quickly turns to decay. Pick peaches which have a creamy or light gold color Don’t count on a pink or blush color as being a sign of ripeness because some varieties do not have this color. Peaches with a green color do not ripen well. Ones which have already started to soften will need to be used immediately but if you want to use them later choose ones which are firm to touch. Even under the best conditions, you cannot prevent peaches from getting some bruises so plan to use them as soon as possible. NOTE: This year peaches are very sweet and juicy. All my baked fresh peach recipes had a lot of juice in the bottom of the pan after baking. 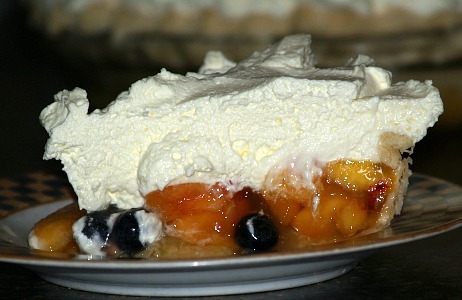 You can spoon it over the pie when eating or discard. 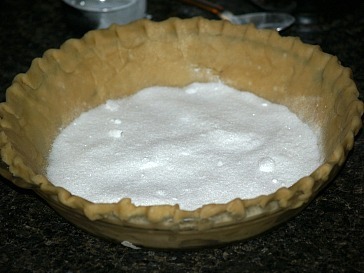 Combine sugar and cornstarch and blend; spread ¾ of mixture over pastry. 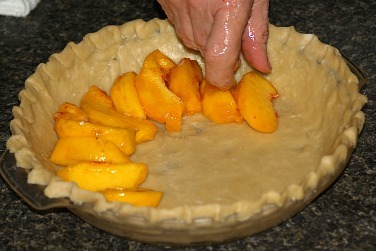 Arrange peach halves in pie pastry over sugar mixture with hollow sides up. Sprinkle remaining sugar mixture over top; pour cream over top with some in the hollows. 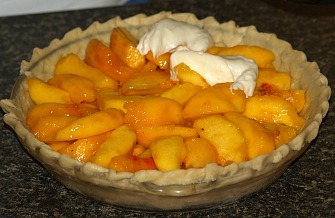 Bake until peaches are tender about 60 minutes.